2017’s convention was a tremendous success, and our Franchise of the Year Nominee speeches were heartfelt and inspirational. As each nominee spoke, a common theme began to emerge: Why I became a Jani-King Franchise owner. Here are eight key points that so many have learned to be true about being a part of the Jani-King Gulf Coast family. By joining the Jani-King franchise system you immediately become part of a much larger, more powerful network than you could have on your own. It comes into play in everything from negotiating the purchase of advertising to making supply arrangements. Never been in business for yourself? No worries. In a franchise system, you’re automatically privy to special training designed to get you up to speed with the ins and outs of the franchise. Moreover, the best franchise systems will provide a thorough briefing on how to operate the business and conduct techniques particular to your franchise. At Jani-King we provide a good mix of classroom and on-the-job training. A transfer of know-how in the training process is at the heart of our proven franchise system and is unavailable to someone in business for him or herself. Additionally, Jani-King Gulf Coast created the Brand Manager position to help Franchise Owners with Sales and Operational issues. If you aren’t meeting with your Brand Manager quarterly, your business is missing important opportunity. Jani-King Gulf Coast also offers an annual classroom training at convention designed to help your business grow, all focused on helping your business to become more successful. When Franchise of the Year Nominee, Jemarcus and Danielle Smith opened their Jani-King franchise in 2014, they didn’t know much about starting a business and knew even less about starting one specializing in commercial cleaning, even though Jemarcus had plenty of hands on cleaning experience. But that didn’t stop Jemarcus, a former oil field worker, and Danielle, who worked full time for Fed Ex, from opening their Lafayette, LA franchise. Because the operational systems were in place and the training armed them with the necessary know-how, their business is flourishing and profitable, with 2017 sales projected to top $300,000. “My number-one reason for buying a franchise rather than starting my own business is that my chances of being in business five or 10 years later and making a profit are greatly increased by buying a franchise,” says Jemarcus. You have a team of people helping to protect the integrity of the brand. Being a part of the Jani-King system requires adhering to set rules and regulations. The upside is that quality control is a priority, and you can rest assured that you’re working alongside fellow franchisees who are doing their part to maintain our standards. In addition, your regional office will make sure all franchisees are pulling their weight and operating at optimum performance. This is why Jani-King implements MSE’s, inspections and quarterly reviews. Not only do they help protect the brand but they also pinpoint opportunities for franchise training and growth. By purchasing a franchise, you’re buying into a business that has already been developed, marketed, and, most importantly, made familiar to the average consumer. 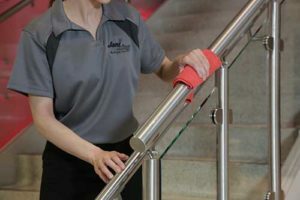 Rather than having to begin from square one, you can hit the ground running as Jani-King, The King of Clean – a major brand that people already know, like and trust. You’re part of a franchise system that accommodates your needs. For example, Jemarcus Smith, a franchise owner from Lafayette says, “ I put my kids on the bus every morning, I never thought I would be able to do that.” Some people want to work only during certain parts of the year or they don’t want to manage employees. With Jani-King, you can keep your day job until you grow enough to work full time in your own business. When you’re ready to add additional staff is entirely up to you. Jani-King uses a tried and tested formula. One of the most daunting challenges of starting your own business is the amount of time it takes to fully test the products and/or services you’re trying to sell. Going out on your own requires a leap of faith, and many are comforted to know they’re leaping into a system without all the kinks. We take out the guess work and equip you for success. You don’t have to go through it alone. Starting a business can be intimidating. It is a test of endurance as you find your way through unfamiliar territory. However, your Regional Office is just a phone call away. You’re surrounded by a support system that will not only be there as you set out, but will also continue down the path with you.